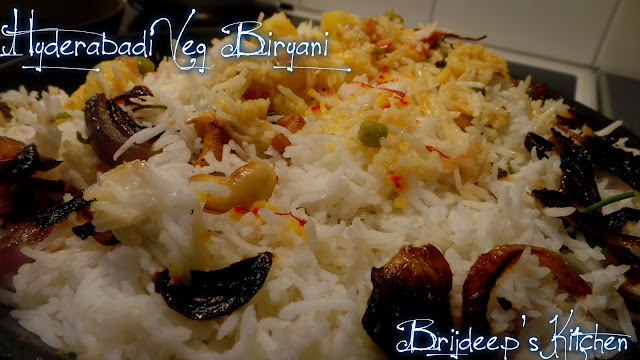 Me and my wonderful friends have always maintained that Biryani always equals mutton biryani and you cannot actually call anything else a biryani at all; and I'm sure my non-vegetarian friends would agree to the core. As I have not been eating meat for quite a long time now, I have always prepared chicken biryanis and fish biryanis and loving and embracing my biryani with all my heart. 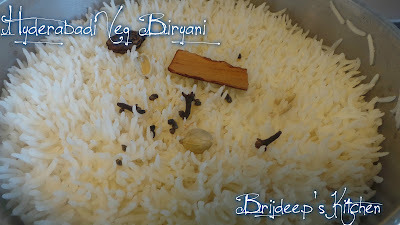 To a non-vegetarian like me, the first choice for biryani would undoubtedly be mutton/chicken and that's the reason I haven't prepared anything remotely which would both be vegetarian and a biryani; well I call the vegetarian version a pulao. 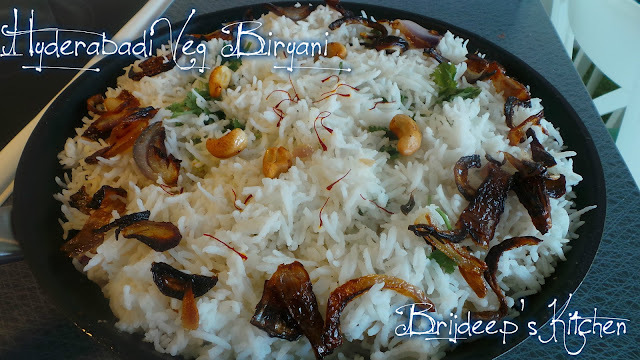 But recently I had vegetarian friends over and that was the sole reason to make me try my hands on making a vegetarian biryani. 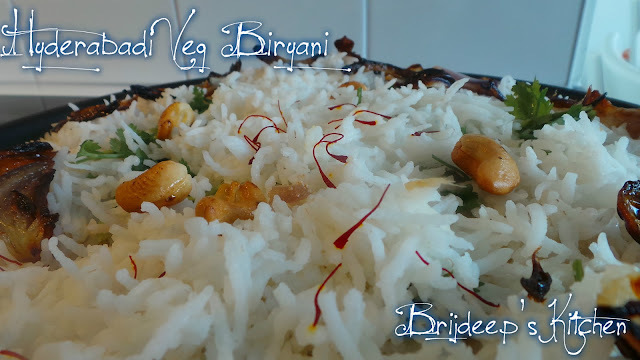 I did not want to serve a pulao, but something special; so I chose to prepare this Hyderabadi Vegetarian Biryani: inspired from my recipe of Hyderabadi Chicken Biryani which I have prepared and devoured many a times. 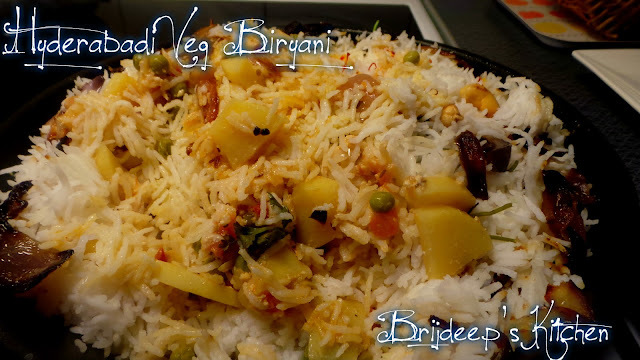 This is an elaborate recipe with long preparation time, and even though I never imagined, I actually loved the light and royal feeling, both at the same time with each bite of this flavorful biryani: the goodness of vegetables, the aroma of spices and the royal taste with cashews and saffron will make you drool just at the sight of this amazing dish. So let's move on to the awesomeness !! First we will prepare the rice: Boil the rice as you normally do. If you want to see how I boil rice without a rice cooker, check this link: How to make perfect boiled rice. I drain the water and cover and let cook in steam and that's where I add the spices: cloves, green cardamom seeds (and covers separately), black cardamom and cinnamon. Add the spices after draining the water and before covering. Or you can add the spices while boiling the rice as well if you don't want to drain the water. Now we prepare the vegetable curry. Heat oil on medium flame and add the whole spices: shahi jeera, cardamom, mace, cloves, cinnamon and bay leaves. Add the chopped onions and let fry until they turn transparent. Add the ginger-garlic paste and fry until the raw smell goes away. I have used grated ginger and garlic in this recipe. Add the chopped tomatoes and sprinkle a little salt. Let cook until the tomatoes are soft and mushy. Add the red chilli powder and mix well and let cook for another minute. Add the chopped and prepared vegetables: potatoes, carrots and peas. You can also add cauliflower and green beans if you like but I did not add in this recipe. Sprinkle little more salt and mix everything well. Let cook for about 2 minutes. Add the yogurt and mix well. Do not add any water. Cover and let cook for about 10 minutes or until the vegetables are tender. If adding cauliflower, add the florets to boiling water before adding to the curry. Remove the cover and turn off the flame. The curry is ready and now we will layer the biryani. 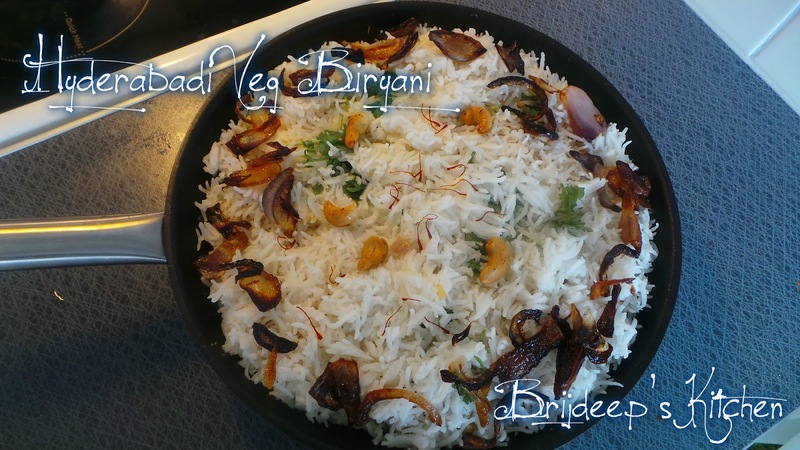 Layering the biryani: Take a heavy bottomed pan and add the ghee to the base. This will prevent the biryani from sticking to the base. Add a thin layer of rice and spread evenly. 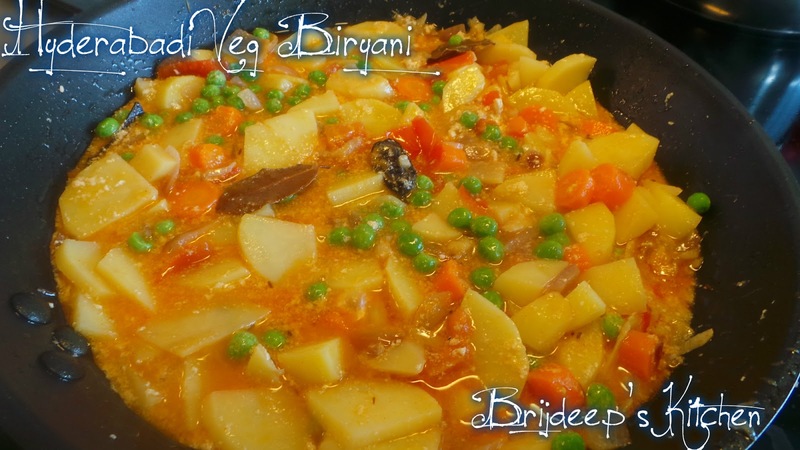 Add a layer of the prepared vegetable curry. Sprinkle chopped mint leaves. Add another layer of rice and another layer of vegetables over it. Sprinkle the chopped coriander. Add the final thin layer of rice over it and cover everything evenly with the rice layer. Add the milk over the layered biryani and sprinkle the saffron strands over it. Cover and add weight over the lid (or seal it with dough) and put this complete setup over minimal flame for about 20 minutes to let every flavor mix in together and produce a wonderful taste. 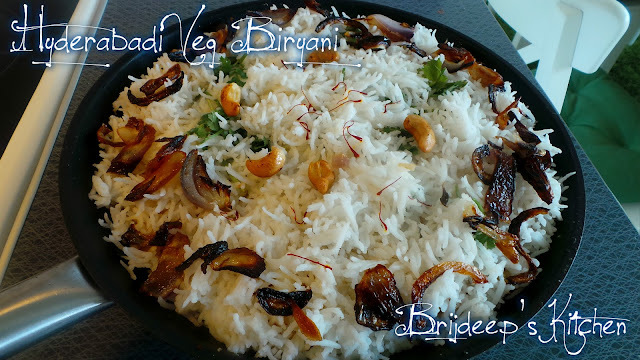 While the biryani is cooking on slow flame, prepare the onions and cashews. Heat the oil and another pan and add the sliced onions. Let fry on medium flame until the onions fry completely and start getting brown and crispy. Drain the oil and remove the onions on kitchen paper to absorb extra oil. In the same oil, fry the cashews until they start becoming little brown on the sides. Turn off the flame, drain the oil and remove the cashew too on a kitchen paper. To use up less oil in your biryani, fry the onions before you begin to prepare the vegetable curry. In step 3, first fry onions, then cashews and use the same oil for making vegetable curry. Open the lid carefully and top with the fried onions and cashews. Mix carefully and serve hot. The accompanists for Hyderabadi Biryani is always Hyderabadi Mirch Ka Salan but you can also prepare Tamatar Ka Salan or Baby Onion ka Salan to go with the biryani. 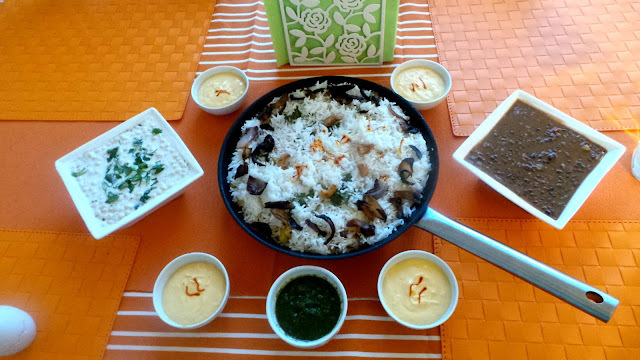 I had prepared this as a main course meal for my guests so did not prepare Salan but rather served it with rich and creamy Dal Bukhara, Boondi Raita, Mint coriander chutney and Mango Shrikhand for dessert. Loved this recipe? Do leave a comment and share a picture; join me on my Facebook Page for regular recipe updates and Pinterest. Looking for more vegetarian rice and biryani varieties? Try this Green Broccoli Pulao, Kashmiri Pulao, Mint Rice, Malabar Vegetable Dum Biryani, Achaari Coriander Pulao, Mix Vegetable Pilaf and Qubooli Biryani.